Dr. Soraya Moore Coley feels that a quality education remains one of the few pathways to social and economic well-being in a global society. Her life’s work is dedicated to creating access and opportunity to those who are the least likely to afford that an education is possible. Often referred to as a “community-minded” administrator, Dr. Coley has built bridges between the university and the community through her service, her research, and her work as an administrator. 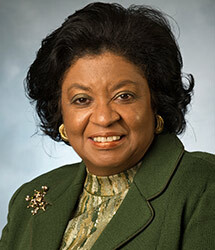 Dr. Coley has over 25 years of academic and administrative experience. In her next administrative position, Dr. Coley will become the sixth President of California State Polytechnic University, Pomona (Cal Poly Pomona) – and the first woman to serve in that role. She recently served as Provost and Vice President for Academic Affairs at California State University, Bakersfield, and was Senior Research Fellow at Children and Family Future’s National Center on Child Welfare and Substance Abuse. She has also served as Provost and Vice President for Academic Affairs at Alliant International University, and is Professor Emeritus at California State University, Fullerton, where she served as Dean of the College of Human Development and Community Service. Dr. Coley earned her bachelor’s degree from Lincoln University (PA), and her MSW and Ph.D. degrees in Social Planning and Policy at Bryn Mawr College’s School of Social Work and Social Research. She is married to Lt. Col. (Ret.) Ron Coley.